Fuel is fed to the system by an electric fuel pump that delivers fuel to the mixture control unit. 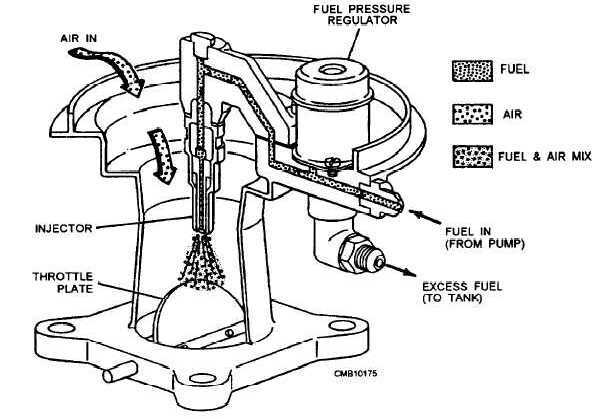 A fuel pressure regulator maintains fuel line pressure and sends excess fuel back to the tank. The mixture control unit regulates the amount of fuel that is sent to the injectors based on the amount of air flow through the intake and the engine temperature. The unit is operated by the air flow sensing plate and warm-up regulator. The accelerator pedal regulates the rate of air flow through the intake by opening and closing the throttle valve. A cold-start injector is installed in the intake to provide a richer mixture during engine start-up and warm-up. It is actuated by electric current from the thermal sensor any time the temperature of the coolant is below a certain level. The throttle body injection (TBI) system (fig. 4-46) uses one or two injector valves mounted in a throttle body assembly. The injectors spray fuel into the top of the throttle body air horn The TBI fuel spray mixes with the air flowing through the air horn. The mixture is then pulled into the engine by intake manifold vacuum. The throttle body injection assembly typically consists of the following: throttle body housing, fuel injectors, fuel pressure regulator, throttle positioner, throttle position sensor, and throttle plates. The THROTTLE BODY housing, like a carburetor body, bolts to the pad on the intake manifold. It houses the metal castings that hold the injectors, the fuel pressure regulator, and the throttle plates. The throttle plates are located in the lower section of the body. A linkage or cable connects the throttle plates with the accelerator pedal. An inlet fuel line and outlet return line connects to the fittings on the body. Figure 4-46. - Throttle body injection.